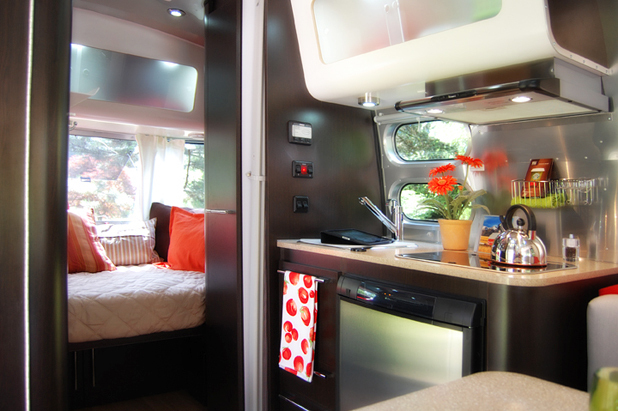 Welcome to a tour of our 2012 Airstream 16 ft. International Bambi (Paprika interior). The International series for the 16′ was discontinued for 2013, and going forward this little trailer will only be available in the sport model. I guess that makes our officially a collector’s item now! Little galley kitchen with fridge, sink and two burner stove. Front dinette area, turns into full size bed. New key and wallet holder…out of the way! Look at all that WONDERFUL space! 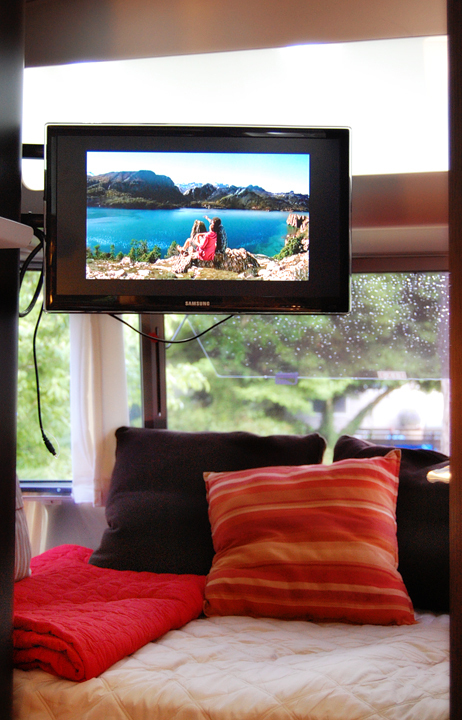 TV located in the rear bed area. Love the wrap around windows back here! 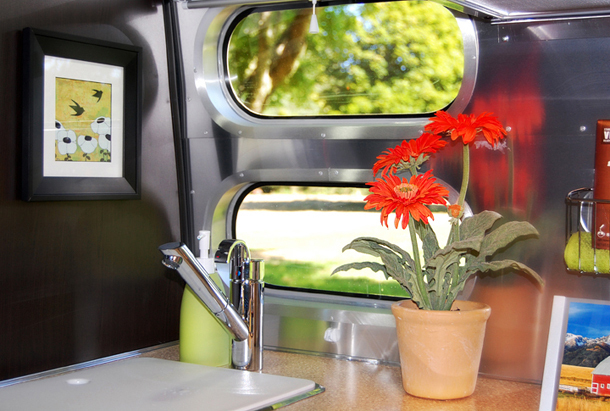 Your Airstream is just beautiful! I love the bright colors! My wife and I are seriously thinking about buying a 19 foot Bambi. We’re in Englewood, Florida, if you ever get this way. Great blog guys! My fiance are leaving Sequim, Wa headed for Austin (living there in our 31). We will be traveling via 101/1. Maybe we will see you on the road! Good luck, Leo! It should be a lovely drive down 101! Lot’s of great state parks located on the Oregon Coast. Hoping you get some good weather, too! Hi, my wife Loretta and I live in Eugene and are about ready to make the big dive and purchase an Airstream. We think a 22′ Sport Bambi. Kids are grown and we as emptynesters, recently transplanted from the East (Virginia Beach) for a job change. I love your blog and your photos. Would love to run into you guys some weekend after the plunge! Our thoughts and paryers are with your family. Hi Mike! We are almost emptynesters ourselves. Our youngest will be off to college next year. We loved the layout of the 22 foot Bambi. We really considered it actually, but the 16′ fit better on our driveway. You’ll enjoy every minute of ownership and since you’re new to the area, you have a lot of beautiful country here to explore! Let us know if you’re camping in the area…we’ll keep an eye out for you. Just to touch base… We bought a 27’FB International Serenity last week in PDX. We are now in the process of filling it up with some new and some old stuff. We really cant wait until we can hit the road in a few weeks. Love your posts and hope to see you in our travels. Love the interior. Its a very happy place. Cant wait to decorate our new 23′ Serenity. I totally agree! Decorating the new Aistreams are so much fun. It will be easy to decorate that beauty of yours! Hi Kim, where did you get the clock? I have a 16ft Bambi that I absolutely love but I must admit that each time I make the bed it’s like a tryout for circus contortionist. Any hints on how you get yours to look so perfect? I can’t seem to locate an inside photo but I’ll snap one next time we are out, we have a small driveway so it stays in storage when not in use. Thanks for the response, I’m gonna try this. Our Bambi is a 2005 and after a while the mattress got a “wave” in the middle the more it got used. To solve this, and the fact that it’s uncomfortable to begin with, I use a twin size memory foam topper which helps alot but it also won’t stay put. I’m gonna take your advice and wrap the whole mess up in a queen size duvet. Love your blog, the photos are fantastic! What a fabulous trip! It was fun to see fellow streamers at Camp Creek and what a beautiful camper you have. I am looking forward to decorating ours and figuring out what works for us trip by trip. These things take time, can’t rush a good thing. Since returning home earlier today I read some of your past blogs. I love all the camping tips and campsite pictures, thanks for that. I saw the photo of your son and you said your daughter is making you and your husband grand parents soon. Congratulations! My mom absolutely adores our son and says it’s the best gift she has ever received. I also read about your battle with cancer. You looked happy and healthy yesterday and I hope that always remains true for you. 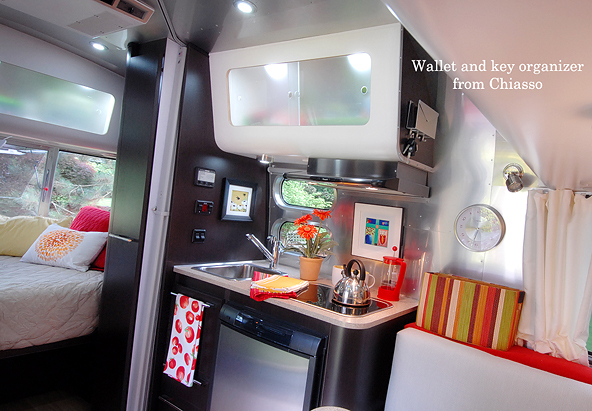 Your airstream is adorable! What year is it? My husband and I are thinking about it. We just bought a 16′ vintage bambi, 1963, I’m very excited to start our adventure. My husband is also a photographer and we plan to do a blog too. Thanks for the inspiration , yours is wonderful. We picked it up last weekend and took it out the next day. We had a great time. If you don’t mind…. you seem to have a similar taste and standards and I’d love to ask you a few bambi specific questions. If you could email us that would be great. My email should be attached here. Thanks in advanced!! R U full X RVers? No…just a couple of weekends a month…someday! R U full time RVers? Just found your site. Congratulations for your great photos and content. I previously had a T&B that I loved but sold two years ago….just a little too small. Am purchasing a 2010 16ft Bambi “Ocean Breeze” from the dealer in Boise who will store it for the winter. I really liked the art hanging on the walls of your Bambi, how did you fasten it? Finally, do you use sway bars or does it tow well without them? Bill, I used velcro strips…they’ve been up for three years now and haven’t had anything fall. The frames are heavy with glass and they’ve done well! Thank you for creating such a beautiful blog. 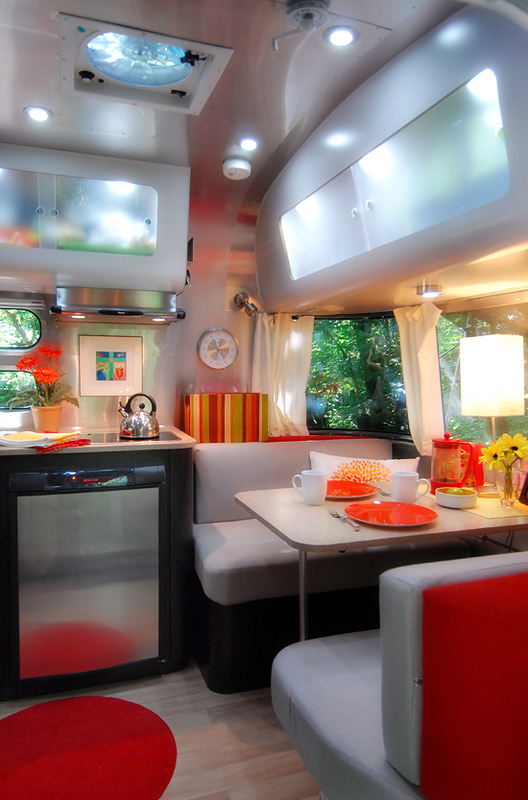 My dream upon retirement is to have your exact Airstream! The decorating is wonderful and your photography is inspiring. I am going to my first RV showing on Jan 12, ’14 in Allentown, PA. Best wishes for a happy and healthy new year. Thank you, Keith! I hope you get your Airstream! We live in Columbia, SC. Does anyone know where I can see with intent to buy a 16 ft AS. We are thinking about a Bambi 16′ for short excursions and have been even more motivated since we saw your site. Thanks! By the way, how do you get such clear, crisp pictures. Sorry – just saw your photography page – super pics!! I just purchased, what is a brand spankin’ new 2013 Bambi Sport. I think I must have lost my mind over it and just taken the plunge. In another life, I RV’d with horse trailer RV and swore never again sleeping in an RV. I can’t wait to try it out. If I discover it’s a mistake, I’ll pass it on! I am wondering where you are, missing your travels, your stories and your photography. I’ll keep checking. May many happy miles continue to roll under your wheels! I am the second Joanne that has lost her husband last year. Would love to travel this way but also would like to know how you feel about a single woman traveling alone. I have heard there are Airstream camp grounds around the country and groups of women that get together in their Airstream’s. Really enjoyed receiving all the information. First time for me. We traded it in, but they sold it right away! Hope you find yourself one! Ours is going to be missed! You seem like the handy type and I have actually borrowed a couple of your ideas, based on your photos; beautiful “home”, by the way! I was thinking of making some kind of cloth storage bag that can be used to load, store, then unload clothes in the bins above the bed; have you done or seen anything like that, by any chance? Jill, I have a collapsable fabric hamper that I keep in the shower….That’s worked pretty well for me. 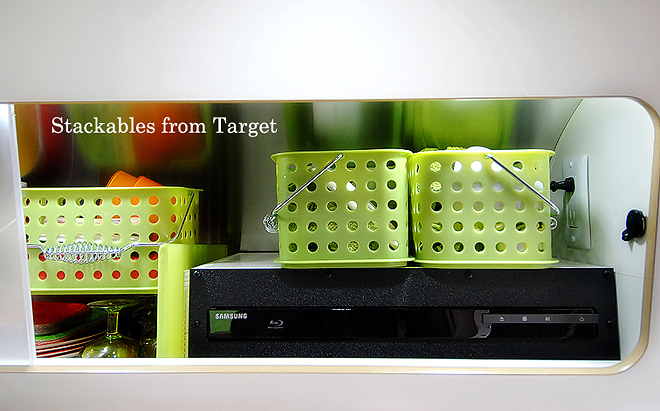 The above bins for me hold towels and dishes….have you tried the container store…they have almost everything! 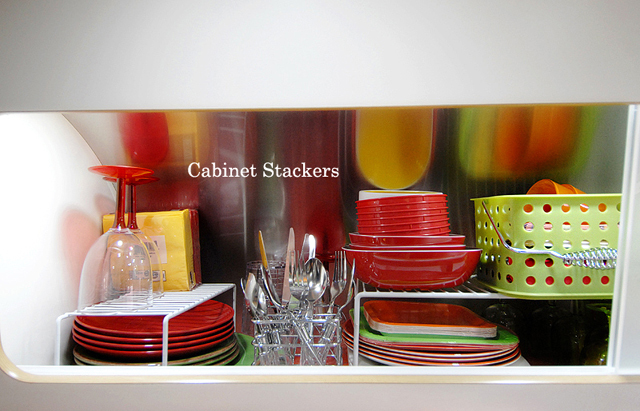 Kim – You’re eye for customizing the interior of your space is amazing! My husband and I just purchased a FC 30″ and are beginning to source items. 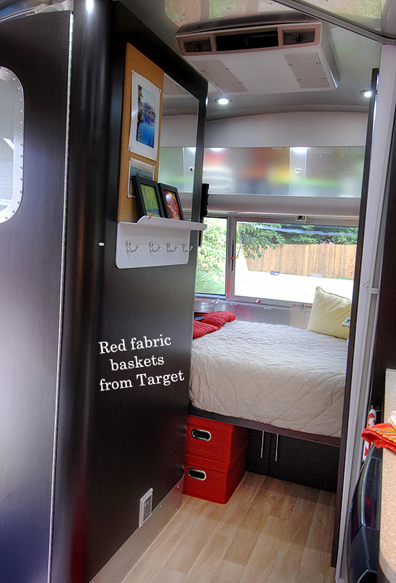 Question for you: Where did you get the bedspread for your new Airstream? We have a queen and I don’t know where to go or what size to get. I love all the built ins, but really want to put our own touch on our place! Just subscribed to your site to stay inspired! 🙂 Thanks. Hi Melinda 🙂 The bedspread is from Pottery Barn. We put a down blanket from Ikea under it. It’s a nice light coverlet that gives a fun pop of color!! So glad I read you blog. We are buying a Flying Cloud 25FB and are both close to six feet. I just ordered the mattress extender. Camping World had it on sale and it costs as much as a pair of short queen sheets. We have a ’64 silver streak. I would love to know where you got the mirror – corkboard -wall hooks mounted on the bathroom door! 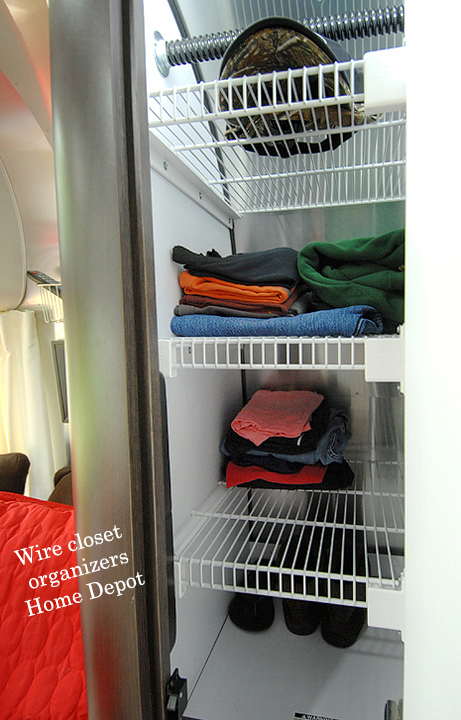 Hi, My wife and I purchased your trailer at Portland Airstream Northwest. Was wondering if you could contact us as we had some questions and also looking for any tips beneficial to owning the trailer. THANKS!! I don’t know how I received your blog but couldn’t be happier. This is my dream! I will love learning and traveling with you. Is there someplace to go to find AS for sale by owners in different parts of the country? We have 16′ sport, and have been incorporating many of your ideas. I’ve been trying to find a mirror for the bathroom door like yours. Do you remember where you got it? The kids are gone and we have this vagabond burr in our socks. The 16′ seems to encompass nearly hassle free schlepping, but we wonder about the two of us in there on long cross-country trips. We have the freedom to work from anywhere, but wonder about ‘escape space’. We are looking hard at the new 16, but thought we’d ask to see if you found it too small. We really don’t want anything larger and we THINK we’ll have a blast…but, shiny new things can sometimes blind us from things we should have considered. We’ve had the 16, 19 and 23. Look me up on instagram (@gm3sf) and write me there. Might be able to help you. What size bed is in the back? I just was referred to your blog from my FB page “Airstream Bambi 16.” One of the people thought maybe we bought your Bambi, since we bought at the Portland AS store. (We didn’t buy yours, btw, different year, flooring, etc.) We live in Washington and have camped in our Sport in many of the places you have shared. One that I don’t see, that you might love is Kalaloch, on the Washington coast! Thank you and enjoy! Is the bed with wrap around windows large enough for 2 people? I did add the same closet racks thanks for the pictures! No one has asked the price! Love your pics and decor but don’t know affordability! I am about to own a Bambi! Love how yours looks!